Do you ever really know your mother, your daughter, the people in your family? In this rich and rewarding new novel by the beloved bestselling author of Talk Before Sleep and The Pull of the Moon, a reunion between two sisters and their mother reveals how the secrets and complexities of the past have shaped the lives of the women in a family. Ginny Young is on a plane, en route to see her mother, whom she hasn’t seen or spoken to for thirty-five years. She thinks back to the summer of 1958, when she and her sister, Sharla, were young girls. At that time, a series of dramatic events–beginning with the arrival of a mysterious and sensual next-door neighbor–divided the family, separating the sisters from their mother. Moving back and forth in time between the girl she once was and the woman she’s become, Ginny at last confronts painful choices that occur in almost any woman’s life, and learns surprising truths about the people she thought she knew best. Emotional honesty and a true understanding of people and relationships are combined in this moving and deeply satisfying new book by the novelist who “writes with humor and a big heart about resilience, love and hope. And the transcendence that redeems. 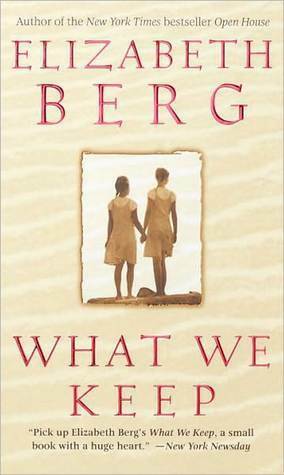 I read my first novel from Elizabeth Berg almost twenty years ago. The book was “Talk Before Sleep” and it was a fantastic read. I was excited to see if I enjoyed any of her other books as much as I had enjoyed that one. One of the next books I read was this one. The description pulled me in and I couldn’t wait to read it. I love reading books that involve mother-daughter relationships, secrets, and family drama, and this one hit all the right notes. Though it’s been many years since I read it, I still have good feelings when I think of it. It’s another book on my to re-read list. Elizabeth Berg writes about women, family, love, and loss in such an amazing way. If you haven’t read any Elizabeth Berg yet, I highly recommend her novels. If you have, I would love to hear what your favorites are!! I love her books too, but haven’t read this one. I loved The Pull of the Moon and The Year of Pleasures. I will have to check out those ones too. I hope you enjoy this one. I never read this author before. Because of your review I will now give her a try. This sounds so intriguing! I’ve not read anything by the author yet!